Even though the Cathedral is overshadowed by the adjoining Basilica of St. Nicolas, it is worth a visit. 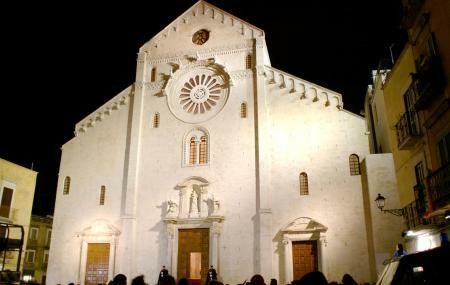 Highly recommended by tourists across the world, it is one of the most important places of Catholic worship and seat for the archbishops of Bari. Built during the Byzantine rule in 1062, the original design resembled a Latin cross. The building was later destroyed and rebuilt after restoration. Houses the relics of St. Sabinus (bishop of Canosa). Awe evoking intricate masonry and frescos. One could participate in an ongoing church service. Private Tour of Bari City. Sightseeing including Basilica di San Nicola and Castello Normanno-Svevo @ Rs 1500 onwards. Love this? Explore the entire list of places to visit in Puglia before you plan your trip. Fancy a good night's sleep after a tiring day? Check out where to stay in Puglia and book an accommodation of your choice. Beautiful to visit. Very moving atmosphere. Sadly I ha e transferred my photos to show how wonderful this cathedral is. Solid building, nicely maintained. Nothing expectacular in Europe. Impredive cathedral situateted in the old town.